If you're looking for a ground beef and pasta casserole, this beef and spaghetti bake is an excellent choice. It's a spaghetti and meat sauce combination baked to perfection with layers of mozzarella and Parmesan cheese. Your family will thank you for this one. 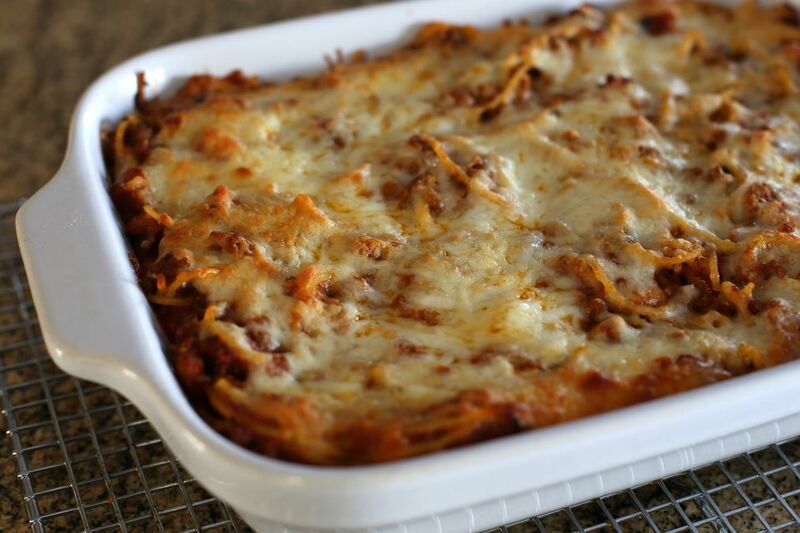 The casserole is similar to the popular spaghetti pie, with its delicious Italian seasoned layers of pasta, cheese, and sauce. Heat the oven to 350 F. Lightly grease a 2 1/2-quart shallow casserole dish or spray it with nonstick cooking spray. In a large skillet or sauté pan over medium-low heat, sauté the onion in olive oil until onion is tender. Add the garlic and sauté for 1 minute longer. Add the ground beef, stirring to break up. Cook until meat is no longer pink; drain off excess fat. Stir in tomatoes, tomato sauce, parsley, and sugar and mushrooms, if using, along with the crushed pepper and oregano. Bring the mixture to a simmer. Taste and add salt and pepper, as needed. Continue simmering the sauce for 20 to 30 minutes, stirring occasionally. Meanwhile, cook the spaghetti in boiling salted water as directed on package. Drain well in a colander and then stir it into the meat mixture. Place half of the spaghetti and meat mixture in a 2-quart casserole and sprinkle with half of the mozzarella cheese and half of the Parmesan cheese. Repeat with remaining spaghetti mixture and cheeses. Bake for 20 to 25 minutes, or until the casserole is hot and the cheese has melted. To make ahead, cook the meat sauce and let it cool. Put it in a container, cover, and refrigerate. The next day, heat the sauce, cook the spaghetti and assemble the casserole in the greased baking dish. Bake as directed above. Add 1/2 cup of chopped green bell pepper to the skillet with the onions. Replace the tomatoes, tomato sauce, parsley, sugar, crushed red pepper and oregano with a purchased seasoned spaghetti sauce. Pour over the ground beef, add salt and pepper, as needed, and simmer over low heat for about 20 minutes.